Motorcycle Repair Course "Using Acid to Dissolve Steel or Aluminum"
the earth is moved exceedingly." It happens quickly. 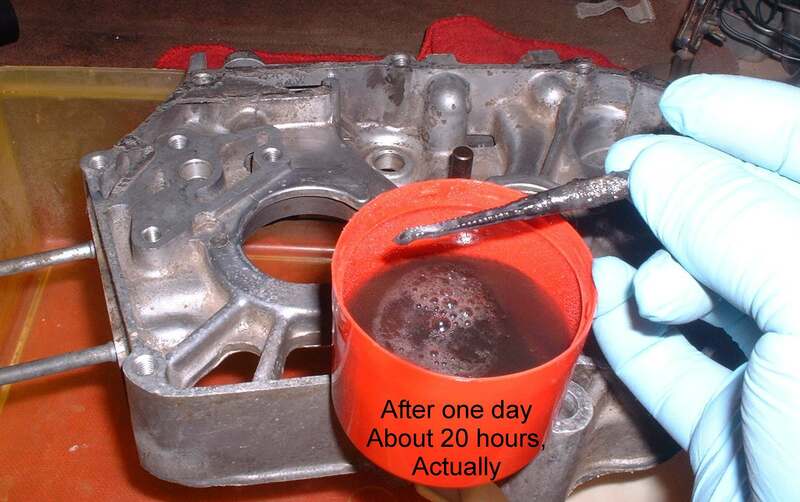 You were just cleaning up some threads in some stinking, lousy crankcase or cylinder head and BANG, it happens. You snap the end of that tap off. Now what? Man, you are just going for it up some dirt hill when the engine makes that familiar sound and stops dead. You drag that pig home, pull the head and look at that. 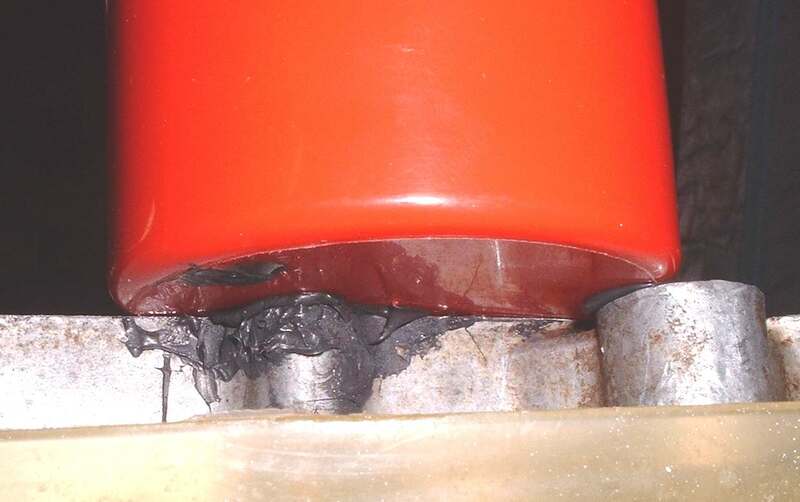 An aluminum piston smeared all over the cylinder walls. What do we do now? Well, there is a way out, but it is a way that has some danger. Different types of acid will Dissolve different types of metals. Trouble is those acids can Dissolve you too! If you are not willing to at least take the basic safety precautions then DO NOT USE ACID! So the first thing we need to do is make sure there is lots of Baking Soda and running water near by. We also need Rubber or Nitrile gloves and a good full Face Shield. Make sure the gloves you use are rated for the acid you are using. I like the cheap Nitrile gloves you can get almost anywhere. The minimum is Baking Soda, ten pounds or so, and Running Water or at least five or six gallons of water in a big, wide, tub. If you need it, you can't have too much, OK? If you get ANY acid on you or your clothes, even a single drop, rinse IMMEDIATELY in lots of Baking Soda and Water. Baking Soda and water will bubble and fizz when it hits acid. That means it is neutralizing the acid. IF YOU DON'T, IT'S OK. I DON'T CARE. IT WON'T HURT ME AT ALL! A non-Ferrous metal is any metal, that does not contain iron in appreciable amounts such as Aluminum. Ferrous metal has some iron in it, like steel. How do you tell the difference? Easy, Non-Ferrous metal is NOT magnetic. Ferrous metal IS magnetic. Get a magnet and put it on the metal in question. If it sticks, it is Ferrous. If it does not stick, it is non-Ferrous. Aluminum is a non-Ferrous metal. Bits of an Aluminum piston melted and smeared all over a cylinder wall can be a real pain to remove unless you plan to use a boring bar to go to the next piston oversize. If you just want to Hone the cylinder you have to get that Aluminum off the cylinder wall. To get that aluminum out of there all you have to do is put some Muriatic acid on the smeared aluminum with an eyedropper. 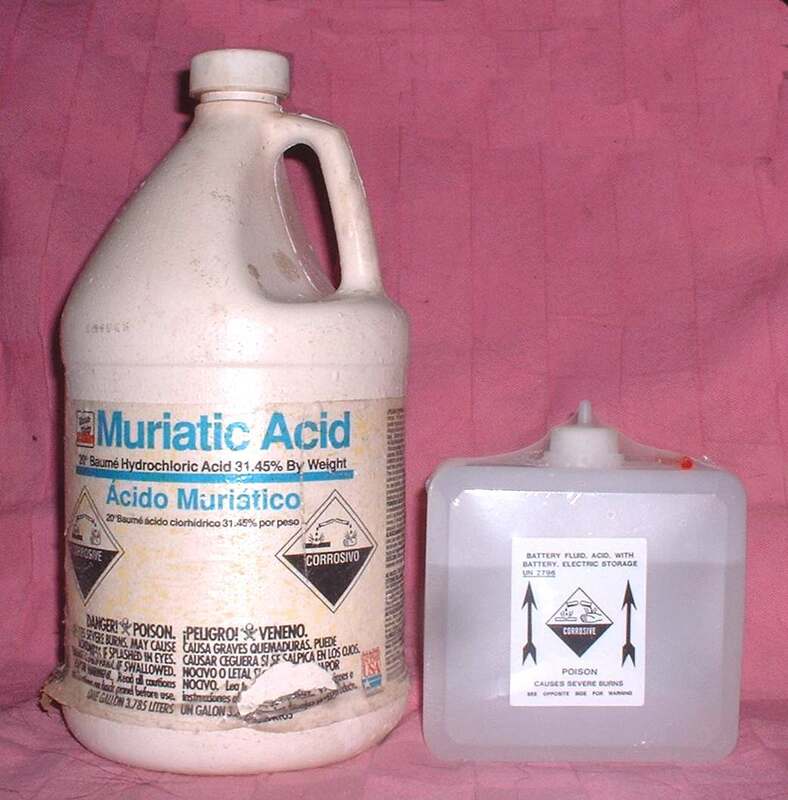 Muriatic Acid is a 31 % solution of Hydrochloric Acid and water. 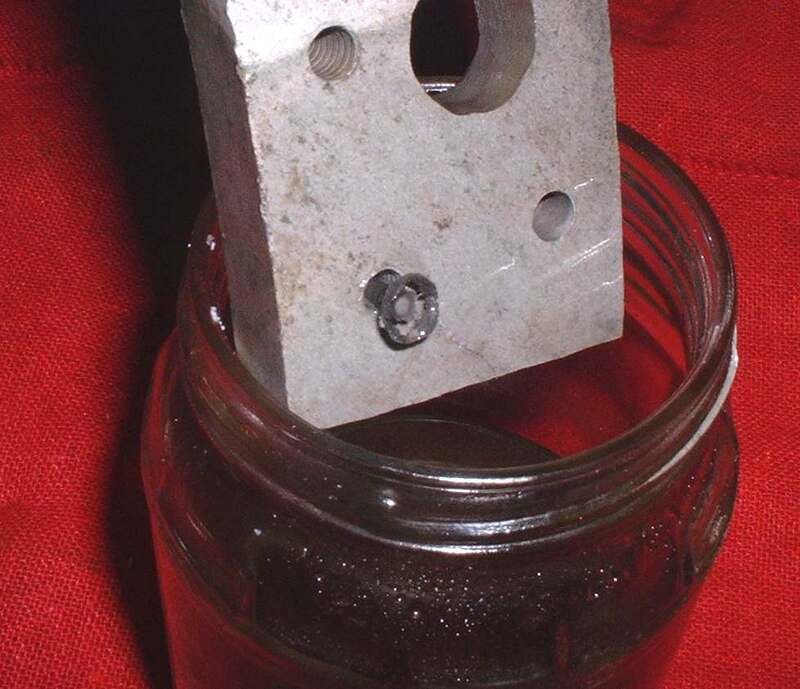 The acid will Dissolve the aluminum and leave the steel untouched. You must be very careful to not get the Muriatic acid on any of the aluminum parts of the cylinder that you do not want Dissolved. As you can see, it bubbles and fumes and releases heat. Along with other bad stuff the fumes contain Hydrogen, which is flammable. Be careful not to breath the fumes. Might be a good idea to do this outside the shop or in a well ventilated area. On this example I put a piece of Aluminum on a piece of plastic and put a few drops of Muriatic Acid on it. Lots of bubbling and fumes. 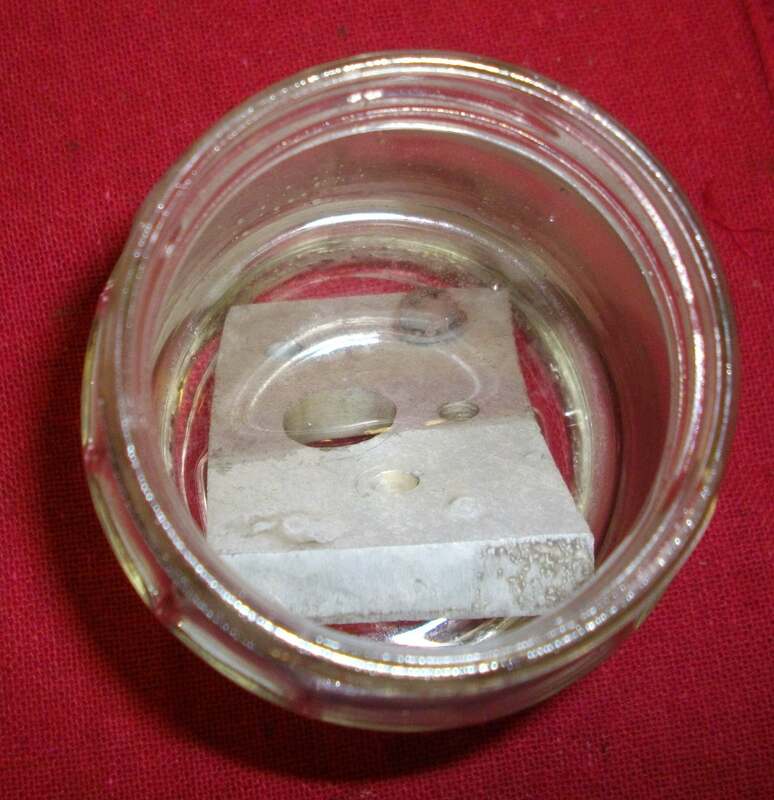 I then put it in about two ounces of Muriatic acid and in about fifteen minutes it was totally Dissolved. I put a steel nut in too and an hour later it is unharmed. You might want to build a small dam of clay in the front and rear of the cylinder you are working on to keep it from getting on any of the aluminum of the cylinder. When done, rinse it off with a baking soda/water mix. Use maybe a cup of Baking Soda and a quart/1000 ml of water. If the Aluminum smear is gone, great. If not, do it again. This stuff really works on aluminum. As far as I know, Muriatic Acid will eat Magnesium too. However, I have never tried it on Magnesium. You can get Muriatic acid at most hardware stores and swimming pool supply stores. 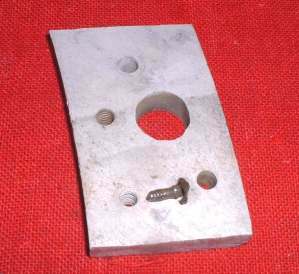 A steel tap is Ferrous metal. For a broken tap or steel bolt you need to use a different type of acid. One that will Dissolve steel and not aluminum. Some say to use Aluminum Sulfate. I did too until I tried it. It works but is agonizingly slow, like months to do anything. I let two new nuts sit in it for over two months and you can see the result or lack there of. Perhaps the stuff I have is not strong enough or I am doing it wrong. Sooo on to something that does work. Battery Acid. Battery acid is no speed demon but works great. 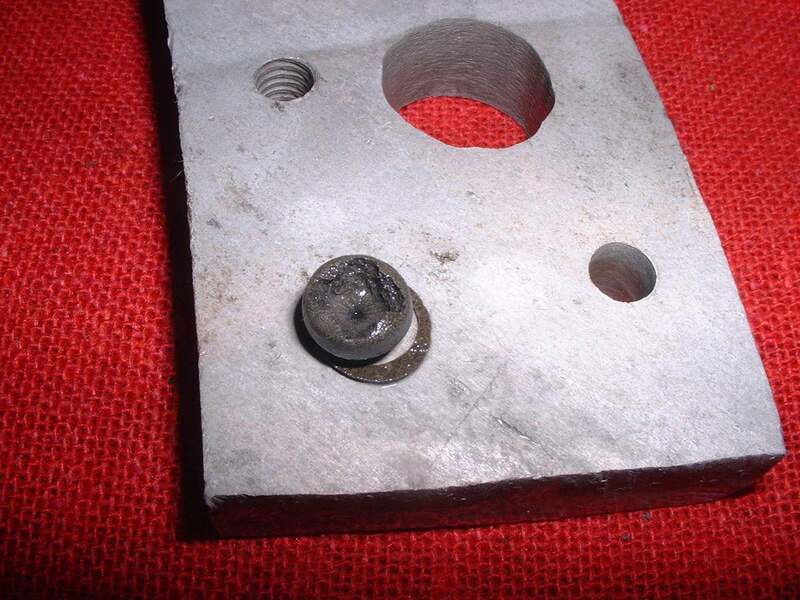 It takes a little under two days to Dissolve a 1/4"/6 mm steel bolt or tap. The active ingredient in Battery Acid is actually Sulfuric Acid. Typical battery acid has about 35 to 36% Sulfuric acid in it. The rest is water. It works slow but steady. I suppose if you want to go faster, you could get a solution with a higher percentage of Sulfuric Acid. You can get Battery Acid at any auto parts store. I have lots of Battery Acid but I don't know were to easily purchase stronger Sulfuric Acid. Sulfuric Acid AVI 32,357 KB -The start. Sulfuric Acid MPG 9,706 KB -Same but smaller file. Sulfuric Acid day 2 AVI 15,146 KB -Bolt is out! Sulfuric Acid day 2 MPG 4,582 KB -Same but smaller file. Sulfuric Acid and Steel Screw. Screw or is easily removable. Sulfuric Acid MPG 2,878 KB -Same but smaller file. Sulfuric Acid day 1 AVI 10,774 KB -One Day and the Tap is out! Sulfuric Acid day 1 MPG 3,284 KB -Same but smaller file. The only problem with Battery Acid, besides it's propensity for Dissolving you, is the time it takes. If you can soak the Aluminum part in the acid you are good to go. 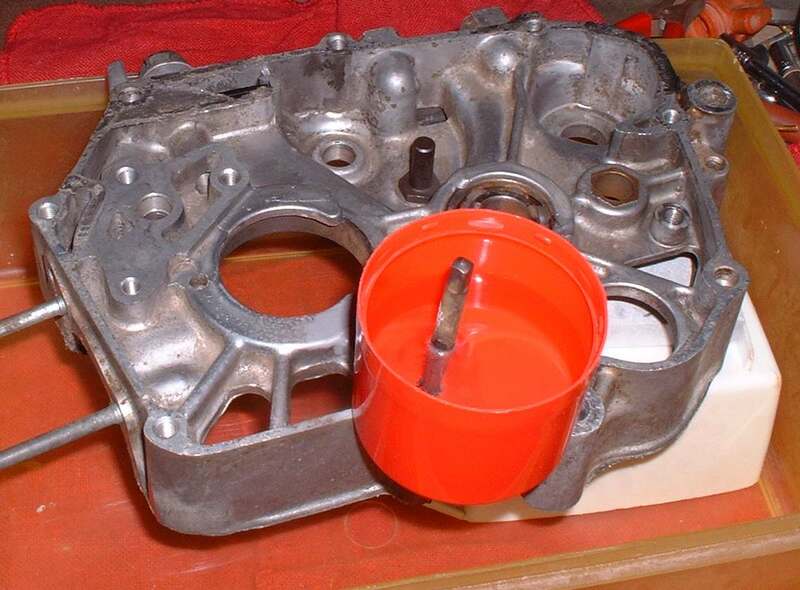 However, if the Aluminum has other steel parts in it, like a cylinder head with steel valve seat inserts, you will need to make sure no Battery Acid gets on those steel parts. I use a plastic cap with a hole drilled in it. Use Silicone Seal and glue it around the hole with the broken bolt or tap in it. In this instance I used Black RTV Silicon but I think others would work too. After it has hardened, fill it up with Battery Acid and wait till the bolt/tap Dissolves. A matter, in this instance, of one day. 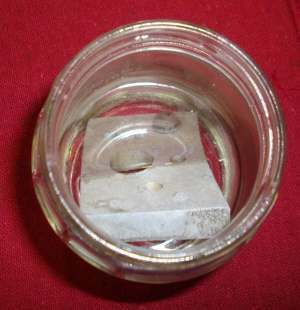 You will need to use several ounces of acid and you may have to change it out, with fresh acid, once or twice to completely Dissolve the Tap. It depends on the size of the tap. As it works the acid color will go from clear to black. When things stop bubbling you are either done or you need fresh Battery Acid. As they say "Your results may vary." Yes, I know. Patience, Patience. Please Lord Jesus, give me Patience and give it to me right now! I'm not sure if the gases that are released by the Sulfuric Acid, as it works, are explosive. With my luck they are. Again, it might be a good idea to do this outside the shop or in a well ventilated area. 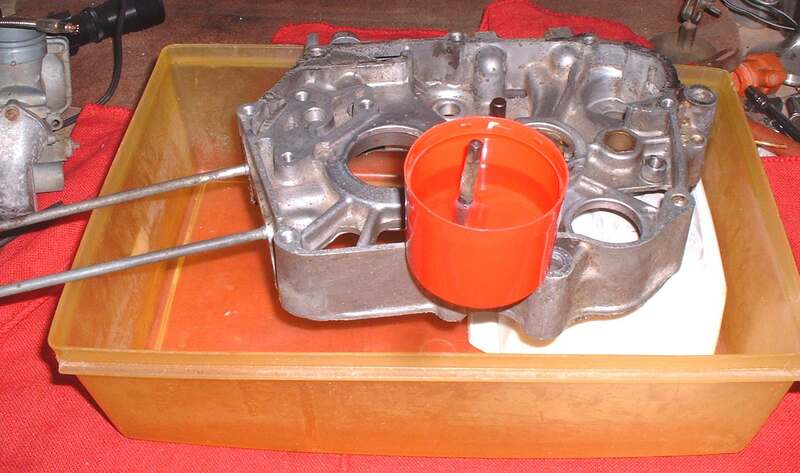 As with any acid, finish off by neutralizing the part with Baking Soda and Water. Story time. Over the years I have ended up working a lot with Battery Acid. Mostly I was just filling motorcycle batteries. Pretty mundane. Now I am absolutely paranoid about Battery Acid. Rinsing my hands in water, dribbling Baking Soda everywhere. Absolutely paranoid about Battery Acid. Even with all my paranoid behavior, every once in a while, I find a tiny acid burn hole in my work pants or shirt. You can't be too careful with this stuff, Kapish? As you can see, this is all a royal pain in the rear. Next time you use a tap, use it gently. especially the smaller ones. Lesson learned! While they won't be Dissolving the Earth in the quantities we are using, these acids will surely Dissolve our broken bolts, taps and Aluminum smears in short order.